Lecture will take place at 7:00 pm in Benton Chapel (overflow room in Buttrick Hall 101). 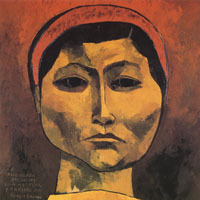 This landmark exhibition presents the work of one of the most highly regarded Latin American artists of the twentieth century, Ecuadorian painter and graphic artist Oswaldo Guayasamin (1919 - 1999). Of Rage and Redemption: The Art of Oswaldo Guayasamin opens with two concurrent receptions on Thursday, February 7, from 5 to 7 p.m., at the Fine Arts Gallery and at the Sarratt Gallery at Vanderbilt, with the former to be presenting the artist’s paintings and drawings, and the latter his graphic production. Both the lecture and the reception are open to the public. All events are free and open to the public. Of Rage and Redemption: The Art of Oswaldo Guayasamin will be on view from February 7 through March 20, 2008. If you are in the area and have the time, it sounds like a terrific opening to attend! How often do you get to hear a lecture from a Nobel Peace Laureate?